✅ Make or Buy Portable Seed Starter Greenhouses? Make or Buy Portable Seed Starter Greenhouses? Starting your own plants from seed is far more economical over purchasing plants. The major expense is time and preparation. In some areas it is possible to sow seeds right into the ground and tend them from seedlings that way. In other areas the growing season is short enough that starting seedlings several months early is necessary to ensure that plants reach maturity before first frost. One way to start seeds before planting is using seed starter greenhouses. These mini greenhouse structures can be bought or created. That depends on how creative you are. A bought greenhouse comes with convenience. These flats often are stocked with seed starting pellets which when soaked swell up and create a biodegradable peat pot that is ideal for starting many seeds. They also have a click on lid that acts as the idea greenhouse environment. On the downside, some are made of such thin plastic that they cannot be reused and the pellets must be purchased anew with each growing cycle. 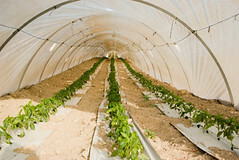 Another method is to make small portable seed starter greenhouses. Doing so allows you to recycle things that would otherwise be tossed in the trash. One ideal method is using a plastic one or two liter bottle although just about any clear or lightly translucent plastic container would work. If you can't or don't want to make a homemade greenhouse, you can always buy greenhouses online at discount prices, and they come in easy to install kits. Start by removing the label and scraping off any glue carefully. If the container has a snap on lid you will only need to add a stick or prop to allow for ventilation if needed but if you use a bottle you will want to cut it in half and then clean it out well. You can use an razor blade knife, scissors, or a soldering tip to melt the plastic. You will want to add holes in the bottom of the container to allow drainage no matter what you use. For a bottle make slits on the sides of the bottom about an inch long. You can use potting soil, compost, or a seed starting medium in the container. You will want about four inches of depth. Moisten the planting medium before placing it in the final location so that it is not damp but not overly wet and the plant your seeds. The top can be snapped on or slid back into place. Another transportable seed starting greenhouse is a tent style cold frame. These are used right over the ground where the seeds are planted and help warm up the local area to get the seeds started. Because they are portable they can be moved from area to area easily. It is recommended that if you live in a location where most crops and flowers can be started right in the ground that investing in several row style portable greenhouses will give your plants a head start. Of course these can be made also. The easy way is to get some clear plastic and some round double prong stakes. 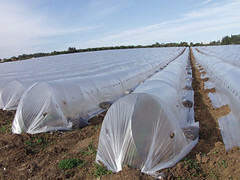 Simply cut the film to fit over the stakes and place them on the rows that have seeds.